So this was a first for me. I’ve never really read a “steam-punk” novel before… (gasp at your computer, its ok). With that being said, it was a little dark, rusty feeling, and dirty. And from what I understand, it hit the steam-punk nail on the head! The main characters showed a wide range of personalities and fit together well. The writing was clear and descriptive, and the story line was easy to follow. 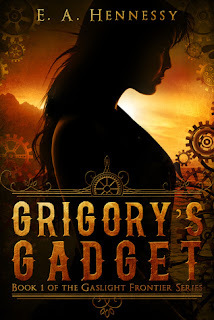 Grigory’s Gadget had me on the edge of my seat from the beginning, and I never knew what would happen next. Hennessy even keeps you guessing about the gadget until the last half of the book! I don’t want to give away any spoilers, but don’t get too hooked to any one character because things change quickly! Overall, Hennessy wrote a thrilling and creative novel and I look forward to reading the remaining books in the series. I would definitely recommend this book to a friend!